I have always felt that coaching is a very personal decision, and people come to coaching when they are ready. I have a general rule to discourage well-meaning people who contact me on behalf of their husband, son or friend who they feel would benefit from coaching sessions. 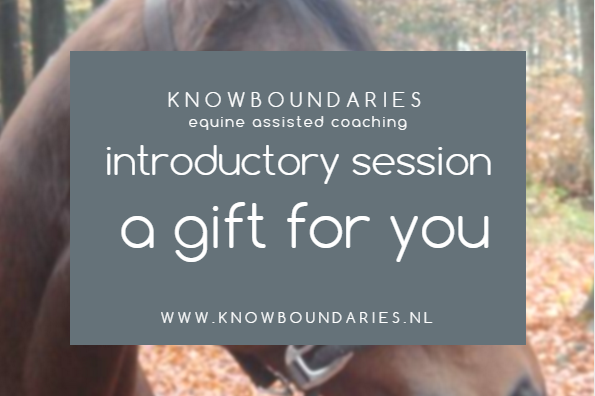 But just before Christmas I was contacted by a lovely lady who wanted to buy a gift voucher of an Equine Assisted Coaching Session for her partner, as a present for his birthday. Feel comfortable to refuse the gift. So I gave her my standard reason why I don’t do that, but she was extremely persuasive, and we agreed not only on the gift voucher but also; another first for me; a double coaching session. In this way, her partner would experience the way the session worked and if he did not want to reveal too much about himself he could more or less take a back seat. I created the voucher for her, personalised with her friends name, but I gave the option that if the voucher was not redeemed before the end of March, I would refund the money. I want all my clients to feel safe, and I felt this option would take the pressure off her friend, and allow him to feel comfortable enough to refuse the gift if needed. It seems he was happy with the gift, because he contacted me very quickly after he received it to book the session for himself and his girlfriend and I had the pleasure of working with them last Friday. They arrived by bike from Amsterdam (an ambitious trip) only 10 minutes later than I expected, but they were very worried because it had taken them much longer than they had expected and he needed to contact someone to change the time of his next appointment. We had tea in the Café at the stables and began the intake process, finding out what were their expectations, what experience did they have of horses, setting goals for the session, and going through the structure and safety aspects. The Café overlooks the indoor arena. One of the horses in training was lose in arena, showing off his power and speed in a series of bucks and gallops; slightly intimidating for my clients: who had not really realised how big and heavy horses could be. We went to the barn and met the two horses we would use; one is mine, and the other was generously loaned to me for the occasion. I asked them to choose their preferred horse, then asked them to take them out of the stable, and begin a mindful grooming process. I could see at this point that one of them was much less confident with the horses than the other; so I kept a close eye on the situation. Safety is my first priority, and building trust and confidence comes naturally in a safe environment. After grooming, we took the horses over to the arena, and began exercises, observing leadership, developing leadership. I had a great time working with them both, and the session was enriched by having two clients observe one another and the horses. We took great strides and they progressed from leading the horses to taking them around a slalom course in freedom with no ropes and experiencing how horses pick up on thought processes and none verbal signals.